Hervey Bay contestants Dan and Steph Mulheron's latest dish, jerk chicken with coconut rice and pineapple salsa, has been described by the judges as amazing and outstanding. MY KITCHEN Rules judge Pete Evans thinks Hervey Bay contestants Dan and Steph Mulheron can go all the way to the end if they keep cooking big, bold, ballsy food. "I think that's what you need to do for the rest of this competition," he told them after describing their jerk chicken dish with coconut rice and pineapple salsa as outstanding. "If you do that, I think you can go all the way to the end." The Channel Seven television show co-host made the comments in the Thursday night episode after the couple pulled through a showdown cook-off against three other teams. They took a risk including pineapple in their salsa, which has cucumber and red onion as the other main ingredients, because the show's other co-host and judge Manu Feildel doesn't usually like fruit with savoury food. In a tense moment, Manu questioned whether they normally served the pineapple salsa with the jerk chicken and Dan admitted usually they didn't. But then Manu revealed he thought the meal was amazing and the pineapple salsa was necessary to balance the dish and cool his mouth down. 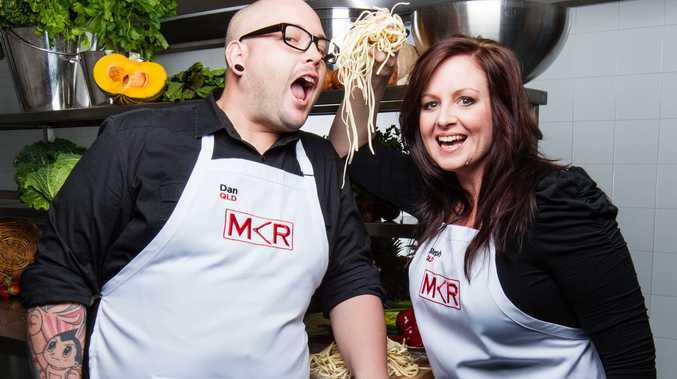 By winning over the judges, the couple have avoided a sudden-death elimination cook-off to be aired on Monday night. Instead, Tasmanian father-and-son team Mick and Matt will face South Australian cupcake and dessert queens Jenna and Joanna. Have you ever been on a TV show? Share your photo and story by clicking here.